by Zora de Grandpre. M.S., N.D.
Our immune system is faced with a complex challenge…the immune system's "job" is to protect us against ALL foreign agents-this includes viruses, bacteria, fungi and environmental agents. In order to accomplish this huge job of defense, the immune system has developed all sorts of specialized approaches and tools which can tell the difference between "self" ("it belongs") and "non-self"(" get this out of here!") The two main approaches are the cellular defense system and the humoral (antibody) defense system. The cellular defense system uses a wide variety of cells to destroy invasive germs, cancer cells and other things recognized as "non-self". The humoral system uses antibodies as a way to eliminate "non-self". So, how does the immune system know what is "self" rather than "non-self"? One way is to use a set of markers found on the surface of cells called the MHC complex. This is the same set of cell markers used to determine if an organ can be transplanted into someone who needs that organ-the MHC complex is used to "match" organs for lung, heart, liver and other transplants. Once the immune system has recognized something as "non-self", it uses multiple lines of attack including cells and antibodies to either kill or otherwise get rid of the "non-self". Various cells including Natural Killer (NK) cells, T-Helper (TH) cells, T-Killer (TK) cells and others kill the invading organism or the foreign cell (like a cancer cell). B-cells make antibody that specifically attaches to the "non-self" entity, coating it in preparation for its removal. Other cells, such as macrophages and monocytes essentially eat the coated entities, destroying and removing it from the body. All the cells of the immune system use various signals to help figure out what is "non-self" and what is "self"-and how to get to the spot where the "non-self" is found. Many of the signals used are non-MHC cell surface markers. One of the more important of these are known as ICAM-1 (Intercellular Adhesion Molecule-1). ICAM-1 helps the cells of the immune system latch onto the insides of blood vessels to get through to the location of the "non-self" invader. Other signals include a large family of molecules called cytokines. Cytokines let the immune system know that there is something "non-self" around and influence the immune system to get rid of that "non-self"-whatever it is. The immune system doesn't work alone, however- and it doesn't always work at 100% efficiency-what does, after all? However, evolution has provided for all sorts of "redundant systems" that work with the immune system. Inflammation, for example, is often seen as an undesirable effect. But, inflammation is part of every immune response and is essential for the success of that immune response. The problems with inflammation occur when inflammation becomes chronic and uncontrolled. Cytokines, which send messages to and from the immune system play a role in controlling inflammation and can either boost the inflammatory response or tamp it down. 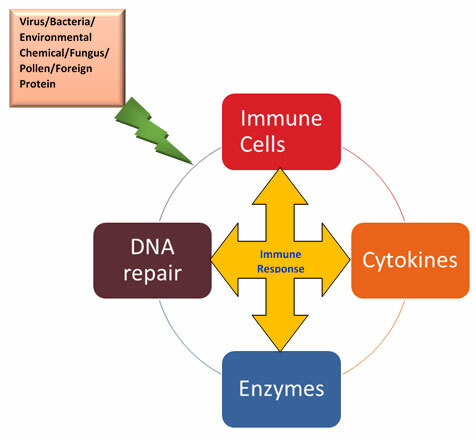 Various enzymes play an important role in the immune response also. Some of these enzymes may play a part in the inflammatory response. The COX-1 and COX-2 enzymes, for example keep the inflammatory response going-this is the reason drugs which inhibit these enzymes are used as anti-inflammatory agents. 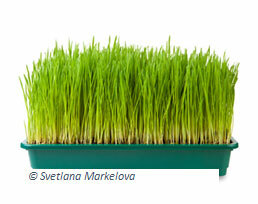 Wheatgrass also boosts the levels of ICAM-1 molecules on blood vessels that feed the tumour. This increase in ICAM-1 allows immune cells to move through these blood vessels and enter tumours more efficiently-and eventually, to kill the tumour cells more efficiently. Wheatgrass also can block some enzymes like RNR (similarly to certain anti-cancer drugs) and boost the action of other enzymes like PARP. The effect of boosting PARP allows cells to repair any damaged DNA or, if they can't, to allow the cells to go through a pre-programed cell death called apoptosis. Most people have heard about the anti-inflammatory drugs Celecoxib (Celebrex) and Rofecoxib (Vioxx). Rofecoxib has been taken off the market because of the risks associated with its use, but Celecoxib is still used to treat a number of inflammatory conditions. Wheatgrass inhibits the same enzymes that Celecoxib and drugs like Naproxyn inhibit-but has none of the side-effects that include increased risk of heart attack, stroke or peptic ulcers. First, wheatgrass works with the immune system, boosting its recognition of "self" versus "non-self" and allowing the immune system to unmask tumour cells and destroy them. Second, wheatgrass also boosts the ICAM-1 system which allows even more immune cells to effectively kill off tumour cells. Third, wheatgrass helps tamp down the inflammatory system by inhibiting the COX enzymes. Fourth, wheatgrass works on enzymes involved in DNA repair, blocking some like RNR and working like anti-cancer drugs while boosting others like PARP allowing either for successful DNA repair, or, if the DNA repair is unsuccessful, for cell death-apoptosis. The overall effect of wheatgrass is a boosted immune system, a controlled inflammatory response and a more effective anti-cancer response. Li M, Yu X. The role of poly(ADP-ribosyl)ation in DNA damage response and cancer chemotherapy. Oncogene. 2014 Sep 15. Bai P, Nagy L, Fodor T, Liaudet L, Pacher P., Poly(ADP-ribose) polymerases as modulators of mitochondrial activity. Trends Endocrinol Metab. 2014 Dec 9. Tsai, C-C., et al, Wheatgrass positively influences immune modulation J Biol Chem, 288(24), 17689-17697, 2013. Wagner, E., Mocharia, R. Barley grass extract fortifies immune system, Ann. Meeting. Am. Assoc. Advancement Science. 1991.